Whatever happened to MGI suing Anea Garcia? Did he actually file a lawsuit? Where did he file? Who won the judgment? Re: Whatever happened to MGI suing Anea Garcia? still being heard in Thailand. joshua wrote: still being heard in Thailand. Really? Any English language articles covering the trial? Did Anea return to Thailand? THE QUESTION SHOULD BE .............. WHATEVER HAPPENED TO MGI AND THAT GIRL FROM INDONESIA ???????????????? WHAT IS SHE DOING ??????????? WHERE IS SHE ?????????? THERE ARE WARS LEFT AND RIGHT ..... BUT SHE IS NOWHERE TO BE FOUND . SHE IS UTTERLY USELESS JUST LIKE THAT STUPID PAGEANT MGI AND THE STUPID OWNER , CROWN BUYING , BIG TIME CHEATER USELESS NAWAT !!!!!!!!!!!! WHY IS THAT INDONESIAN GIRL NOT BEING SENT TO AFGHANISTAN SYRIA OR KOREA ?????? I AM NOT SURPRISED AT ALL , SHE CANNOT EVEN WRITE HER OWN SPEECHES . SHE HAS TO RELY ON NICOLE CORDOVES TO DO THESE THINGS FOR HER . SHE IS TOTALLY USELESS !!!!!!!!!!!!!! IT SHOULD NOT BE .............. STOP THE WAR BUT STOP THAT STUPID PAGEANT !!!!!!!!!! ONCE AND FOR ALL !!!!!!!!!!!!! Gosh you are soooo BLUNT! pilyangfilipina wrote: THE QUESTION SHOULD BE .............. WHATEVER HAPPENED TO MGI AND THAT GIRL FROM INDONESIA ???????????????? WHAT IS SHE DOING ??????????? WHERE IS SHE ?????????? THERE ARE WARS LEFT AND RIGHT ..... BUT SHE IS NOWHERE TO BE FOUND . SHE IS UTTERLY USELESS JUST LIKE THAT STUPID PAGEANT MGI AND THE STUPID OWNER , CROWN BUYING , BIG TIME CHEATER USELESS NAWAT !!!!!!!!!!!! WHY IS THAT INDONESIAN GIRL NOT BEING SENT TO AFGHANISTAN SYRIA OR KOREA ?????? I AM NOT SURPRISED AT ALL , SHE CANNOT EVEN WRITE HER OWN SPEECHES . SHE HAS TO RELY ON NICOLE CORDOVES TO DO THESE THINGS FOR HER . SHE IS TOTALLY USELESS !!!!!!!!!!!!!! I don't know, but I think pageant fans have lost interest since their pageant robbed the advocacy of Miss Universe and worse, the owner even suggested a delegate to lose weight. Yup, the owner, who should not interfere with the selection of the delegates nor make public comments about the delegates, decided to make one, which was unethical. The result? You already know it. I think Anea should join Miss Dominican Republic soon if she wants to avenge the crown she went away from (I'm not sure if she's still qualified, though). Indeed, it is as pathetic as Miss Asia Pacific World! The reigning queen should be shuttling between the US and North Korea and live up to MGI's advocacy. 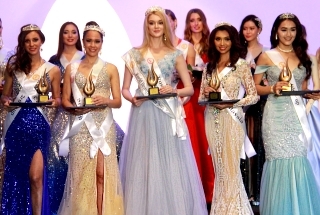 Out of all the international beauty queens, both Stephanie (World) and Ariska (Grand) are the ones who have travelled the most. Just because you hate MGI and dont follow it, it doesnt mean that the queen is "doing nothing". Anea is banned from DR Universe. There was the rumor that she quit MGI to join DRU after an invitation from Magali Febles. 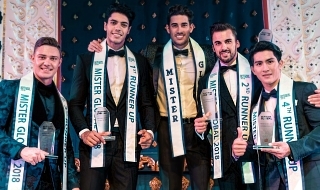 However, people inside the MUO said that they could not work with a girl that is not able to keep a prior commitment, therefore Anea did not join the pageant that year. Afterwards she cut all her hair off and quit pageants for good. 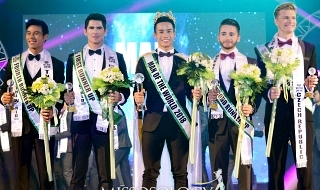 princessleya wrote: Out of all the international beauty queens, both Stephanie (World) and Ariska (Grand) are the ones who have travelled the most. Just because you hate MGI and dont follow it, it doesnt mean that the queen is "doing nothing". I found a photo on Instagram that shows that Anea is now pregnant so that is the final nail in the coffin of Anea ever competing at DR Universe. WME/IMG & Madam Paula intervened Miss Universe Dominican Rep. to allow Anea compete at their national pageant? So WME/IMG & Madam Paula already knew Anea's participation at MGI and the drama surrounding her victory?